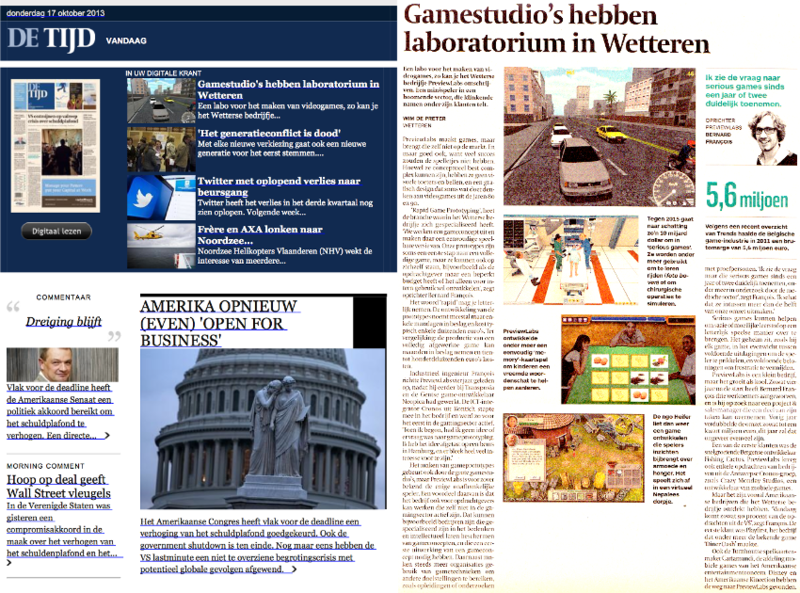 With this title, the main financial newspaper in Belgium, de Tijd, opened its article today about PreviewLabs. The word ‘rapid’ can be taken literally. The development of the prototypes usually only takes a couple of man-days, and typically costs a few thousand euros. In comparison: the production for a completely finished game can take months, with costs ranging between tens of thousands and hundred thousands euros [or more]. More and more organizations are using techniques from games to meet other goals, like education or research. “I noticed the demand in serious games rise clearly over the last two years, for instance in medical research”, François says. “I estimate that [serious games] are good for half of our revenue”. PreviewLabs is a small company, but it’s growing fast. Since the company’s start about four years ago, Bernard François added three employees to the team. Last year, the revenue doubled to a quarter million euros, and this year it will be about the same. Read the full article here (in Dutch).